PROVIDENCE - She's 24, left Brown University early and hasn't lived in Rhode Island for long. And Elizabeth "Libby" Kimzey is the Democrat in the upcoming House District 8 primary who is supported by more than a dozen organizations and prominent politicians, most notably Mayor Angel Taveras. Her opponents are two lawyers - one a seasoned politician with 26 years of experience, the other the incumbent, whose father and grandfather once held this General Assembly seat. The winner among Kimzey, former City Council President John J. Lombardi and State Rep. Michael A. Tarro will almost certainly represent Providence's Federal Hill, Olneyville and Valley neighborhoods in the House, given that there isn't any opposition in November's general election. The West Broadway Neighborhood Association is holding a debate for the three candidates, as well as the Senate District 5 candidates, on Tuesday - a week before the primary election. The 6:30 p.m. forum will occur in the association's headquarters, 1560 Westminster St.
Tarro, a lawyer and director of his family's funeral home business, is the Democrats' endorsed candidate. "I think in the two short years that I served, I have proven I am an effective leader," he said. "That two years isn't long enough. There's a great deal more work that I want to accomplish and already started." In the last session, the 49-year-old was the primary sponsor of 12 bills. Five were signed into law by Governor Chafee, including one that makes it easier for grandparents who are estranged from their grandchildren to get visitation rights. In addition to his legislation, Tarro said he voted for comprehensive pension reform, opposed the governor's proposal to increase the meals and beverage tax, and backed legislation to force tax-exempt institutions to pay their "fair share of taxes" - a significant issue in Providence. Tarro, who previously was a financial auditor, says he plans, if reelected, to tackle such issues as making state colleges more affordable, helping small businesses and creating a business-friendly Rhode Island. "I am starting to hit my stride as an effective legislator," he said. "Now is not the time to make a change." When asked whether he had a weakness, Tarro talked about the historic Grove Street School, which he owned and ultimately demolished after years of court battles with neighbors, city officials and preservationists who wanted to save the 1901 six-room schoolhouse. Opponents said the building could have had many years of use if its owner hadn't neglected it, including leaving its interior exposed to the New England weather with previous demolition attempts. Tarro said the decision to demolish the building wasn't easy, but it had become an eyesore and safety hazard. Tarro found fault in the candidacies of his two opponents. Kimzey, he said, dropped out of college, doesn't have deep roots in the community, wants to implement programs that will raise taxes and "basically threw a dart on the map to pick what district she was going to run in." He said Lombardi really wants to be Providence's mayor and is running for the House seat to keep his name "in the news." Tarro also said Lombardi led the City Council without any pension oversight, which was one of the biggest contributors to the city's financial woes. 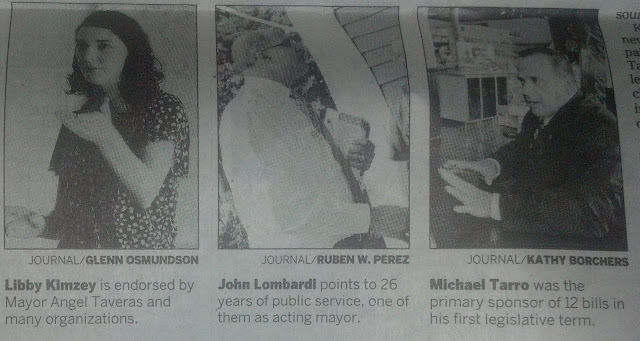 "A negative campaign shows desperation," countered Lombardi, "and I'd like to know what's he's done for two years." Lombardi points to his "26 years of public service," including one year as acting mayor and eight years as council president. Since being elected in 1984, Lombardi says, he found money in the city budget to repair streets and sidewalks and to maintain parks. He says he led the charge to keep West Broadway Elementary School open, helped create the city's ethics ordinance and supported the "homestead exemption and fair property taxes." "I'm the only candidate who has the experience both as legislator and executive," he said, while stating he previously was a lawyer for the state Senate. "Time is of the essence. I don't think we can wait much longer. We need people who are going to go in there and challenge conventional wisdom, question the status quo and hold the leadership accountable when need be." Lombardi said his focus, if he's elected, would be improving the state's economy, including supporting legislation to make loans available to small businesses and streamline the permitting process. He said state officials need to work collaboratively, rather than taking the usual top-down approach. Lombardi also talked about duplicating the project that made Broadway friendlier to bicyclists and pedestrians. Lombardi, 60, said it is also a plus that he has never left the area. He raised his family in Federal Hill and still works there. "This is my passion, the neighborhood," said Lombardi, who once led the Federal Hill House and Zuccolo Recreation Center, and who taught in Providence. The Providence Teachers Union recently voted to endorse him. Kimzey, a self-proclaimed progressive Democrat, said she chose to leave Brown to be active in the community. She received a community development award from the West Broadway Neighborhood Association as part of the team that helped rebuild the Dexter Park playground, she mentors at the Rhode Island Foster Parents Association, and is active with English for Action, Common Cause and several other groups, according to her website - www.libbykimzey.com - and campaign releases. Kimzey is also a director of programs at Capital Good Fund, which she described as a Providence nonprofit which provides small loans, business workshops and consulting in personal finances to individuals unable to access capital through traditional sources. Kimzey is not a political newcomer. She was campaign manager for Teresa Tanzi, the union-backed challenger who beat House Judiciary Chairman David Caprio in the 2010 primary and went on to win the District 34 seat. "Everyone is looking for someone who will represent their interests," she said. Not only does she say she represents "the priorities wanted," but Kimzey also says she lives a "more average lifestyle than my opponents." She rents, doesn't own a car, and she bikes, walks or rides the bus to work. She says she is easily accessible and understands "we all come from complicated stories, but what matters are the lessons you take from the challenges." The killing of her 12-year-old brother, Jack, in 2007, made her more compassionate. Her brother was killed by their mother in New Jersey while Kimzey was a freshman at Brown. "The specific stuff with my family was very unusual," she said. "I don't think that should guide public policy. I am here today to talk about what we can do to make Providence a fairer place to live in." Her priorities are fixing the state's transit system and city schools. She also wants to improve public safety because "there are parents who won't let their kids go to the park even if they can see the park from their window." She has lived in Rhode Island for seven years, and she calls the state "home." "I have lived here twice as long as anywhere else," Kimzey said, explaining that her family moved around a lot because of her father's telecommunications career. She chose to live in Federal Hill because, among other reasons, it's a changing neighborhood with a rising art scene. Kimzey has garnered support from numerous organizations, including the Rhode Island Latino Political Action Committee, R.I. Progressive Democrats of America, R.I. National Organization for Women, and the Green Party of Rhode Island. "There's a great neighborhood feeling in the whole city, and I want to make it better," she said.